WHY MERCY JOHNSON TOOK THE GEJ TRAIN…LIKE SERIOUSLY?! Mercy and her whole family! This is basically an excerpt of a press conference Mercy Johnson granted, explaining why she took the GEJ train. As much as I love this chic, I ain’t falling for all the fibs she told about her Range having some mechanical faults. So, does that explain why her whole family, including her husband took the train? I’m not trying to create any bias here, but really, these ‘Jonathanarians’ should stop trying to hard to convince us to keep them. 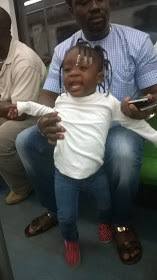 My picture and that of my daughter, Purity in a Lagos train has surfaced online and quite a number of people have asked me what I was doing in a train and in Lagos for that matter; not Paris or London.I was around Iddo at Ebute Metta when my Range Rover developed a mechanical fault and I had to make a very important appointment in Ikeja regardless of the usual traffic congestion in Lagos. Luckily, a member of my management team was around, he suggested a train ride and we were in Ikeja in less than 30 minutes but that is not the crux of this statement. Like I mentioned earlier, I have had to answer questions in private and public as to why I would board a train because trains in Nigeria are considered a means of transportation for the ordinary and not-so-rich people. A friend called and said I just devalued my brand by being on the train with ordinary people. I couldn’t help but laugh. Are we extra ordinary people because we are celebrities? In as much as I understand the concept of branding, packaging and exclusiveness, I will never trade the experience to sit, interact and feel the pulse of so-called ordinary people. By the way, I am part of the ordinary people. I grew up as an ordinary person among ordinary people. Why would I avoid them now? Would that be because I am now famous? Without these ordinary people, how would I have been famous in the first place? Without the so called ordinary people, where would Nigeria’s growing population of so-called well packaged celebrities be today? For the purpose of clarification, I was not on that train due to lack of money to get a well packaged cab or to get somebody to bring another car from the house but, my car developed an unforeseen fault and I needed a fast , reliable and convenient alternative immediately as there was urgent business to be attended to and I respect time a lot. The train was available where I was; most importantly, I did not want to turn down the opportunity to be with the people who would ordinarily not have access to me so I grabbed the opportunity with both hands and here we are. This entry was posted in Gossip Galore and tagged GEJ train, Mercy Johnson. Bookmark the permalink. ← WHAT KIND OF PROMO IS THIS? !